Last week I discovered Kevin Ashton, (on Twitter—not a bad place to hang out from time to time) a British technology pioneer in RFID (radio frequency identification) networks, for which he coined the term, “The Internet of Things,” and co-founder of the Auto-ID Center at MIT. 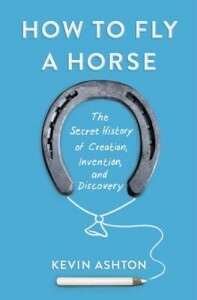 He is also the author of the new book, How to Fly a Horse. If you read my blog often, you’re probably wondering about now what this has to do with mental health, and I admit it’s a stretch fitting this post into today’s theme. Perhaps it would fit better in Writing on Wednesdays… but here it is. Stay with me. Creating consumes. It is all day, every day. It knows neither weekends nor vacations. It is not when we feel like it. It is habit, compulsion, obsession, vocation. The common thread that links creators is how they spend their time. A sketch? A stanza? A paragraph? An experiment? Twenty lines of code? The answer is always the same: “yes” makes less. We do not have enough time as it is. There are groceries to buy, gas tanks to fill, families to love and day jobs to do. People who create know this. They know the world is all strangers with candy. They know how to say “no” and they know how to suffer the consequences…. 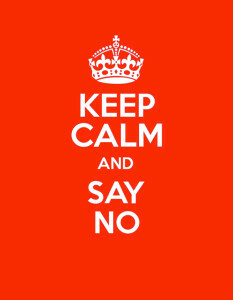 “No” makes us aloof, boring, impolite, unfriendly, selfish, anti-social, uncaring, lonely and an arsenal of other insults. But “no” is the button that keeps us on. I don’t get many invitations to parties or lunch or dinner with friends. I hope it’s not because I’ve become all of those things Ashton says about people who say “no”—aloof, boring, selfish, uncaring, etc. So if I am asked to a social event I’m probably going to say “yes.” It’s the volunteer work that I’ve gradually backed away from as my writing life has moved forward. Does this make me a selfish human being? Maybe so. But I have to hope that I am serving in other ways, that my words serve the greater good somehow. And I hope I’m always available for a friend in need and I’ll do anything for my family. I’m just not signing up for committees and on-going commitments that will pull me away from writing several hours every week. I will, however, take time to host literary salons and meet with writing groups and help organize workshops and conferences. But these events fuel my creativity rather than sucking time and energy away from it. 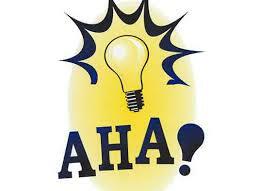 There’s probably no such thing as “Aha creativity.” People who believe in it are never very productive or successful. I meet them all the time. They say things like “your book is wrong, I have all my best ideas in the shower.” And then I ask them what they do. And the answer is always the same: they are working on something or other, but it is unfinished, and therefore unsuccessful, and it is seldom enough for them to earn a living. Because they believe they can only create when and if inspiration strikes, they waste a lot of time trying to cultivate the lightning—time that they could be spending actually creating. “Creativity”—some magical property that only a few people have—probably isn’t real. He explains more about this in the Tattered Cover interview, which I highly recommend. I’m seeing the essays I write and the novel I’m revising and the anthology I’ve just pitched to an academic press as “invention.” And I’m thankful for any creative gifts I might have that fuel the invention. Meanwhile, please forgive me if I say “no” to your requests for my time. I guess, like Ashton, I see much of the world as strangers with candy. Great post. And yes, we do need to be ready to pay the price. There is the isolation that comes from no longer getting those invitations, because there is always that day when we feel sorry for ourselves not to be invited out to lunch. There is the guilt that comes when after saying “No, sorry, this is my only day to write this week and I can’t hang out,” that the person you have said this to so many times suddenly disappears from your life. I had one such friend die suddenly and I am still trying to forgive myself. But now I have this daughter who has watched me say no over the years, watched me succeed in a number of arenas- hard won but nonetheless success. And she is succeeding as well. So as with everything, the yin and yang of compromise. Thank you, Susan. This is very timely today. Whew. I’m so glad my first comment was a positive one, Nina. I’m sure I’ll get some flack for this… here or on Facebook. But I’m hoping to stir a conversation, not just get a pat on the back for the road I’m choosing to travel. Glad to you have you as a fellow traveler!